Local seamstress shows you how to use library resources to fix your stuff! Registration is required. We will explore a variety of ways to mend denim both by hand and by machine in this class. Local seamstress Allison Murphy, owner and designer of utilitu sewing + design, will lead students through brief hands on exploration of ways to patch denim. 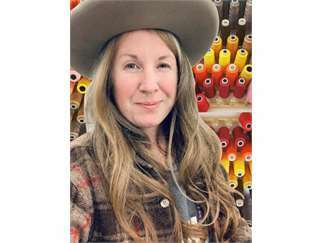 Allison Murphy has been sewing for 30 years, 10 of which have been in Bend for her business utilitu sewing + design, which focuses on creating custom and original designs, alterations and repairs, and teaching sewing classes to all ages of learners. She is a founding organizer of the Rubbish Renewed Eco Fashion Show (a yearly fundraiser for REALMS Schools since 2010), and helped create the High Fiber Arts Symposium (with Scalehouse in 2016). Allison lives with her husband and two children, along with cats and pigs, with dreams of being off grid in the future (yes, she has a treadle sewing machine for when that time comes).